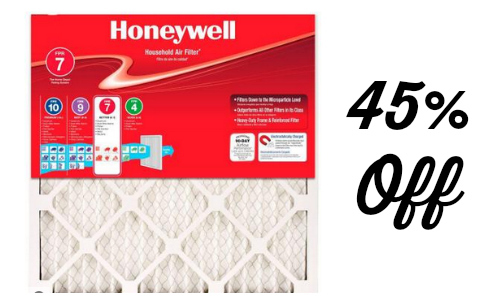 Today only, get a 4-pack of Honeywell air filters for only $22.99 (reg. $42) at Home Depot! That is only $5.74 per air filter! Every home needs air filters, so don’t miss out on this great way to save at Home Depot! Deal is available today only or while supplies last. Limit of 5 per order. Shipping is free. Trying to decide which ones to buy? The easiest way to find out what size you need is to go check the one you have right now. I wrote it down and emailed it to myself just in case I ever forget. Now I can look it up instead of going back through the trouble. This is especially important if your AC unit is in an out of the way place like a crawl space or basement. In doing my homework, I learned that you could sort the air filters by their FPR rating, but apparently this is a metric that Home Depot uses try to compare the products. It really doesn’t mean a whole lot though and you are better off choosing based on the MERV index. Merv stands for minimum efficiency reporting value. This is the industry rating that tells you the level of filtering you can expect. The higher the number, the more efficient it is at removing particles from the air. The scale is 1-16. Anything above an 8 is considered a “commercial” application so don’t let them up-sell you on a more expensive filter with a MERV of 12 because it’s not really going to do much for you. I needed a 16x25x1 air filter and there were 15 options to choose from on HomeDepot.com. After comparing the price per filter to the MERV and FPR ratings, I found that although the price seemed to go up with FPR rating, the MERV ratings on most of the filters are actually the same… I could choose a MERV 6 for $3 a filter or a MERV 11 for $5-$8 per filter. I’ll let you guess which one I picked!